Photo by the CA National Guard. Some of the new water storage projects plan to use Article 21 water in part to fill their projects. What is Article 21 water and how often is it available? 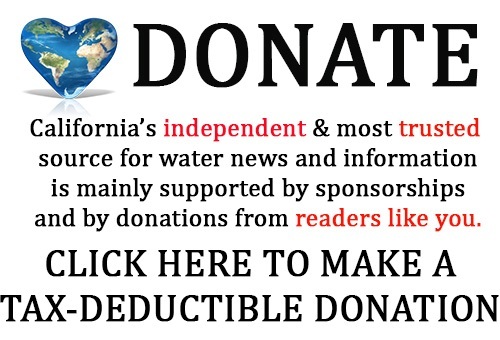 The nine members of the California Water Commission have been tasked with deciding how to award the $2.7 billion in Prop 1 funds slated to pay for the public benefits of water storage projects, and competition is pretty fierce among the eleven competing projects. However, in order for these newly built storage projects to be filled, there must be water available to be put into that storage. Some of the projects have suggested that the water for their project might come in part through ‘Article 21’ water. So what exactly is Article 21 water? On hand to brief the Commissioners on that very question at the March meeting of the California Water Commission was Tasmin Eusuff from the State Water Project Analysis Office at the Department of Water Resources. In her presentation, she gave a definition of Article 21 water, its availability, the allocation process, and how Article 21 water has been administered in the past. The Department of Water Resources has long-term water supply contracts with the 29 contractors who receive water supply from the State Water Project. The Table A amount is the maximum amount of water that is allocated and delivered under the water supply contract; Article 21 water is identified in the water supply contract as non–Table A water that becomes available on an intermittent, interruptible basis. Ms. Eusuff noted that it’s sometimes called ‘wet weather water’ as it is offered to contractors when there is ample water in the system, the forecast is showing more precipitation on the way, and there is pumping capacity. Delivery of Article 21 water cannot impact the Table A allocation of the any contractor’s water, nor can it negatively impact project operations, she said. A contractor cannot defer their Table A allocation because they are getting Article 21 water; Article 21 water is excess water. “For example, if a contractor is not asking or requesting for Article 21 water but just taking their Table A deliveries, but other contractors are taking Article 21 water through the reach where the contractor who is not taking and they are getting some injuries or not able to take their water, then the Department has the ability to say that, we cannot deliver Article 21 water,” she said. 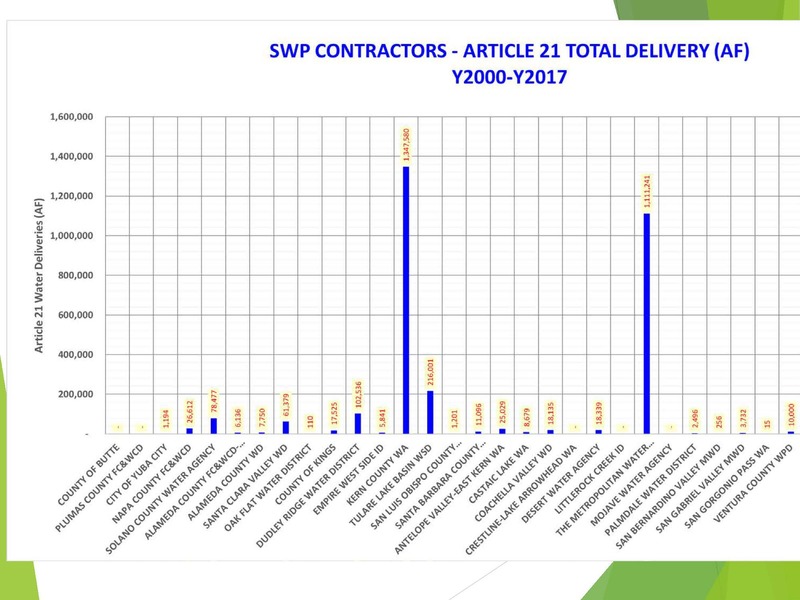 Other provisions include the note that delivery to specific contractors may be limited by the operational capacity in SWP facilities or as a result of changed operational conditions; also, Article 21 water is available to SWP as determined by the Department and is limited to the amounts not needed for fulfilling contractors’ Table A supplies, she said. 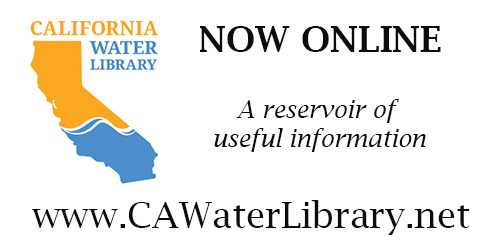 The process for determining Article 21 water availability and allocation begins with the State Water Project Operations Office determining that the water will become available based on forecasted and existing hydrology; they then notify the State Water Project Analysis Office how much Article 21 water might be available. The State Water Project Analysis Office then notifies the contractors that the water is going to become available, and those that are interested come forward and agreements are put in place. Once the contracts in place, the Department will ask them for their Table A demand, their carryover or any other demands, and their Article 21 demands on a weekly basis. This all happens very quickly, Ms. Eusuff said. Once it is determined that Article 21 water is available, the program is administered on a weekly basis, but the water allocation is done on a daily basis. If the contractors total requested amount is less than what the Department can provide, they are delivered those amounts. If the requests are more than the Department can provide, it is allocated to them based on their maximum Table A account amount. Ms. Eusuff then presented a chart showing the historical Article 21 deliveries from 2000 to 2017. She noted that Article 21 water corresponds to the wet water years; in 2005, the State Water Project had a 90% allocation and delivered 731,000 acre-feet of Article 21 water; in 2011, there was an 80% allocation and 420,000 acre-feet of Article 21 water was delivered; and in 2017, there was an 85% allocation and 297,000 acre-feet of Article 21 water delivered. She presented a graph showing which of the 29 State Water Project contracts has had an interest in Article 21 water from 2000 to 2017, noting that Kern County Water Agency and Metropolitan Water District have been the top contractors for taking delivery of Article 21 water. 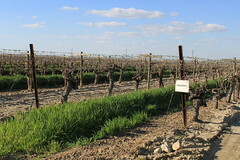 Over the past 18 years, Kern County has taken the most with 1.35 thousand acre-feet of Article 21 water, and Metropolitan next with deliveries of 1.1 thousand acre-feet. 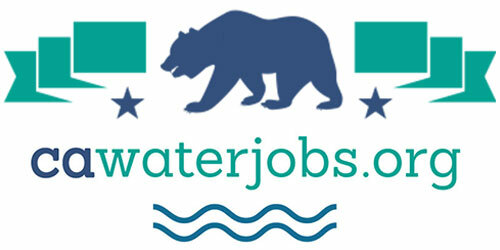 Other contractors include Tulare Lake Basin Water Storage District with a bit over the 200,000 acre-feet; Santa Clara Valley Water District has taken 60,000 acre-feet, and Dudley Ridge Water District at about 100,000 acre-feet. She presented a slide (bottom, left) showing Table A Allocation in red; the actual amount delivered each year in green; and the Article 21 water in blue. She noted that it is in the wet years that Article 21 is available for contractors to take delivery of. 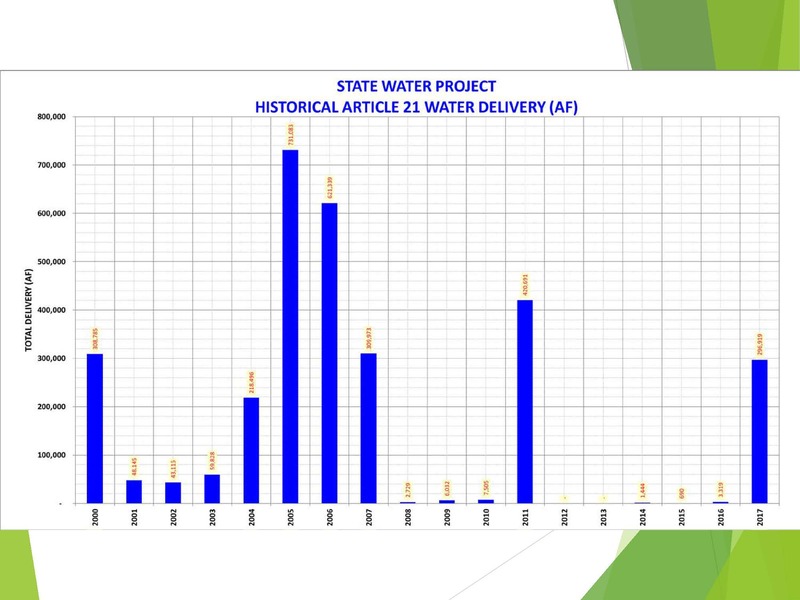 She next presented a slide (above, right) showing the annual percentage of Article 21 water for the last 18 years, noting that the highest was 2005 at 20% of total deliveries. Last year, it was 8%, and in 2011, it was 12% of total water delivery. She presented a slide showing the monthly distribution of Article 21 water among all the contractors (below, left), pointing out that it is very heavy towards December, January, February, March, April, and May, which again corresponds to wet weather of the year. The highest is in March at 73,000 acre-feet, and in February it was close to 38,000 acre-feet. During the discussion period, Justin Frederickson from the California Farm Bureau Federation, noted that 2017 was one of the wettest years ever, so why was there such a difference between what was requested, allocated, and delivered in 2017? So it was controlled by demand … ? “Yes, and the ability to store the water, because it’s short notice water – it’s a surge of water, and you have to take it if you have the means right then,” she said. Commissioner Del Bosque asked how easy is it to get Article 21 to places for recharging groundwater? Ms. Eusuff said that there aren’t any restrictions on how Article 21 water can be used, so if the contractor has ability to deliver water to their subcontractors or to some groundwater recharge projects, there aren’t any restrictions or requirements on Article 21 water that would restrict that. 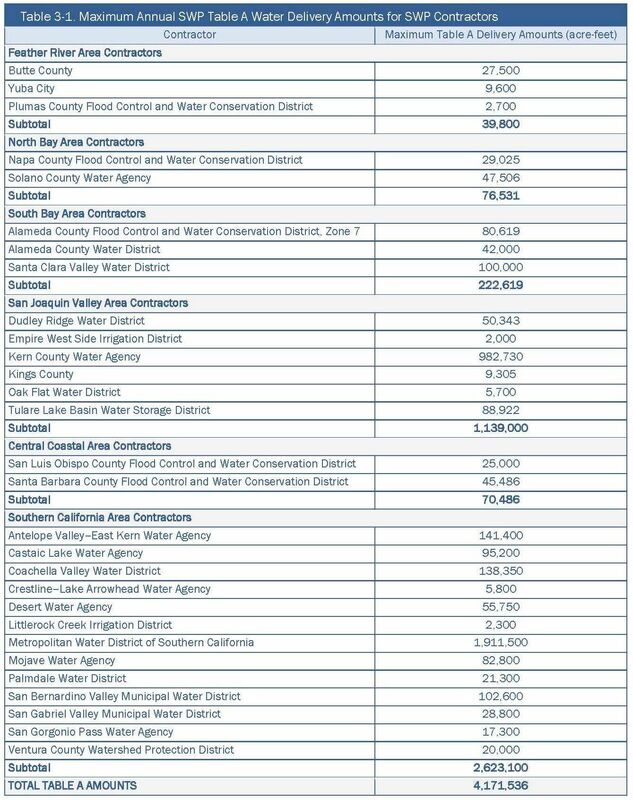 When it says, ” Over the past 18 years, Kern County has taken the most with 1.35 thousand acre-feet of Article 21 water,” does it mean 1.35 million?